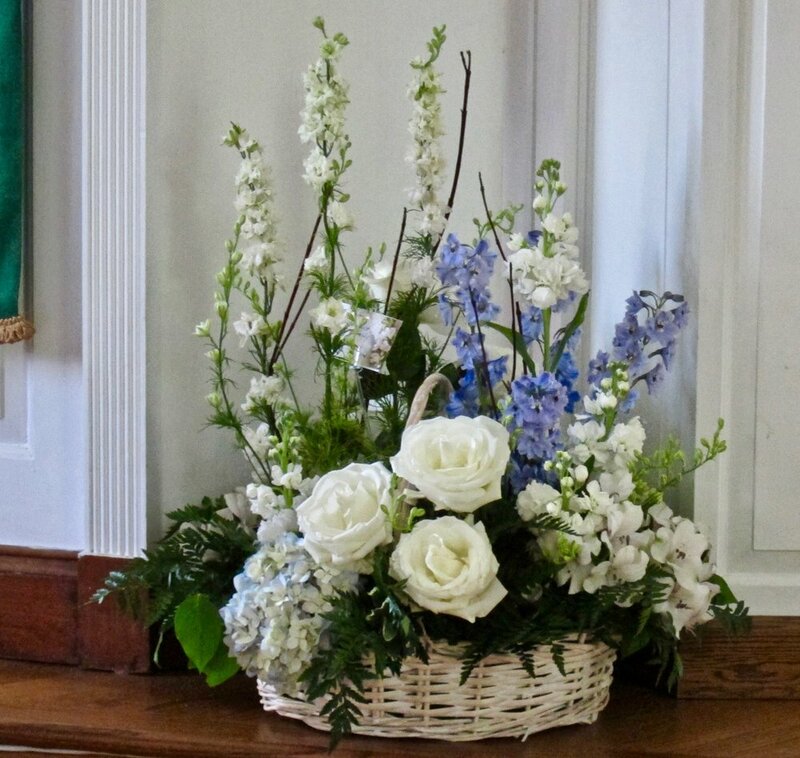 MEMORIAL TRIBUTES can be designed for the formal traditional service or sympathy gift as well as an informal celebration of life. Perhaps a basket of flowers, vase bouquet or centerpiece arrangement to the family home would be more appropriate. We also make faux floral wreaths for long-lasting outdoor cemeteries. See Baskets and Plants for more sympathy gift ideas. 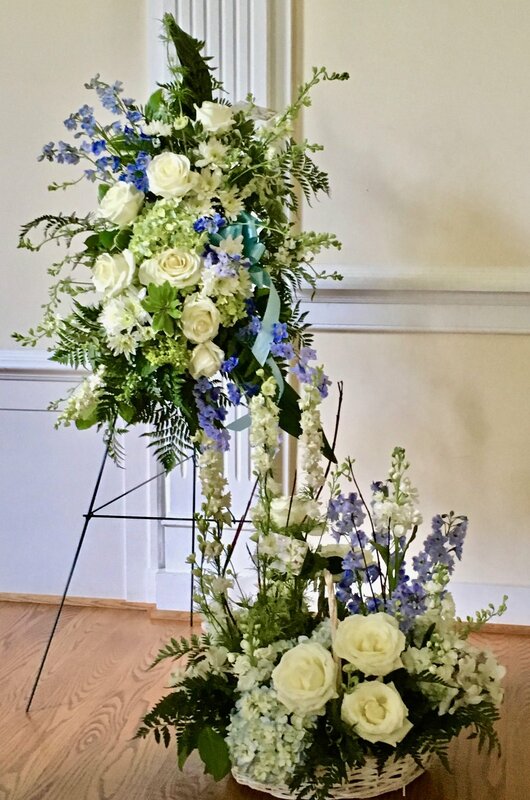 ALTAR ARRANGEMENTS can be custom designed for all occasions in the church. Every arrangement is unique, depending on the flowers available in season. Ribbons, bows and cards may be added at no additional cost. 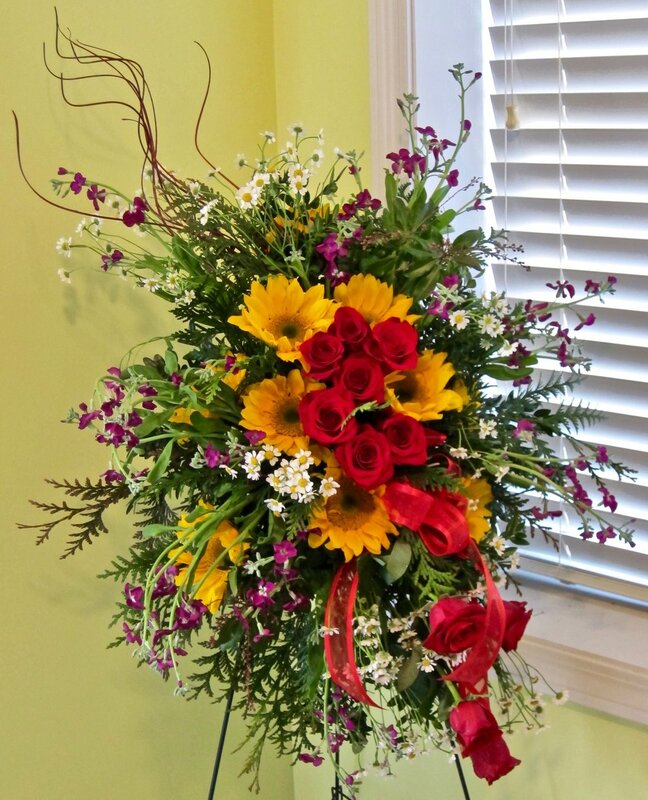 We deliver in Nellysford, Wintergreen Resort, Stoney Creek, Afton, Roseland, Faber, Lovingston, churches and funeral homes in Nelson County, Virginia. Contact us if you have any questions or are ready to get started! Browse designs . . .
With a base of hydrangeas and foliages can be done in many color combinations for an interesting one-sided arrangement, $75. Premium flowers in large basket, $129. Medium basket for $79. Small basket, $55. Select colors of your choice, one-sided orientation, $75, round orientation, $95. Small 30 inch easel, $109 or large 42 inch, $179. Small 30 inch easel, $109 or large 42 inch easel $179. Fragrant white lilies with alstroemeria in a tall vase arrangement, $80. Lilies and orchids in a silver or gold compote, $120. Roses of any color, accented with alstroemeria in a large gathering vase, $65. White roses with blue or green accents, about 10 inches high and wide, $55. 15 inch floral wreath with pillar candle, $119. 24 inch wreath with 3 pillar candles, $219. Wreaths can also be placed on an easel with no candles. Waterproof lined basket displays two blooming plants and measures 21" long by 15" high. Sourced from local growers, long-lasting, $49 to $69. Can be custom made for long-lasting outdoor tributes. Priced according to size and materials ranging from $50 to $95. For questions or ordering, call or send us a message. Footer boiler plate information goes here. Mei atomorum convenire percipitur in, eum facete nonumes ea, no putent signiferumque quo. In brute democritum qui, sea movet munere numquam cu. Et ferri exerci vim, ne ius scaevola percipitur. Brute partem ponderum sed ea. Noster minimum dissentias vix in. No enim gubergren repudiandae eum, mutat dictas an duo.